When traveling for work, there's no doubt some me time is needed. But finding activities on the fly in a new city can be tricky. "When it comes to mobile experiences, there's no mobile, universal brand to get access to amazing activities," said Varun Khona, CEO and co-founder of Headout. The San Francisco-based startup wants to be the go-to app for last-minute activities. With Headout's app, customers view and book activities like helicopter tours, Broadway shows. Because activities can be booked no more than 24 hours in advance, the prices are discounted. 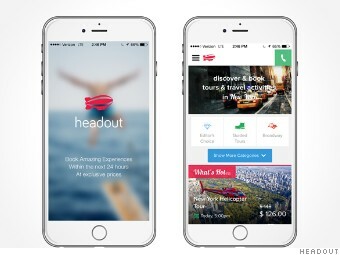 Headout, which participated in accelerator 500 Startups, partners with select vendors to secure tickets. Khona said they've already sold to 20,000 travelers since launching in June 2014. Right now, it's only live in New York and Las Vegas, but plans to launch in Los Angeles, San Francisco and Chicago over the next few months. For other activity-based travel startups, check out personalized activity suggestion app Peek.